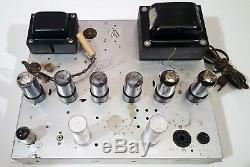 This 1956 Magnavox mono tube amplifier model 128E includes its matching phono preamp control and. The original L-shaped wooden control panel overlay from the Magnasonic phonograph console it came from. The big 128E amp contains four 6V6 tubes and two 5Y3GT tubes, as well as a 12AX7. The original power indicator light is still wired in. 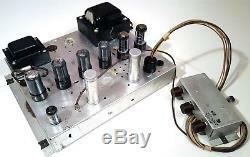 The preamp contains a single 6AV5 tube and has three knobs that control volume, treble, and bass. The bass switch also turns the power on and off. 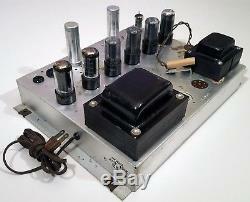 Preamp has a mono phono input and a hard-wired rca cord that connects to the main amplifier. 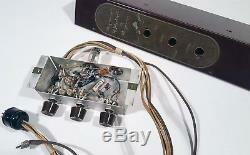 The small 12AX7 and 6AV5 tubes are from Sylvania and Motorola, the rest are all Magnavox brand. The amp platform measures 13 inches x 11 inches x 2 1/8 inches (side mounting fins are 3/4 inch each). 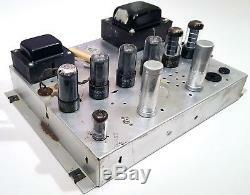 The preamp box measures 5.5 inches x 1.75 inches x 2.5 inches. 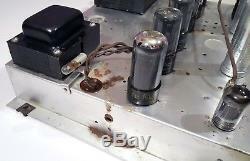 The item "MAGNAVOX TUBE AMPLIFIER 128E with PHONO PREAMP CONTROL 125C VINTAGE 1956 6V6 AMP" is in sale since Tuesday, July 24, 2018. This item is in the category "Consumer Electronics\Vintage Electronics\Vintage Audio & Video\Vintage Amplifiers & Tube Amps".